After the success of our first Radio Days showcase in 2015, set in the golden days of wireless broadcasting, we’re leaping aboard our dramatic time machine and going back still further. Transmission Two : The War Years sees us clutching our gas masks and ration books, with one ear listening to the radio and the other waiting for the air raid siren. A collection of songs, sketches and playlets, from the deadly serious to the downright funny, and all inspired by the period, means an excellent evening of new yet nostalgic entertainment for everyone. So on with your siren suits, use gravy browning and an eye pencil if you can’t afford nylons, and make your way with care through the black-out to Coulsdon Community Centre this April. And put that light out! TWC has been in existence for forty-six years and has an excellent reputation for innovative and independent work, performed to a very high standard. This reputation is definitely maintained, indeed enhanced, by its latest production: ‘Radio Days Transmission Two: The War Years’. 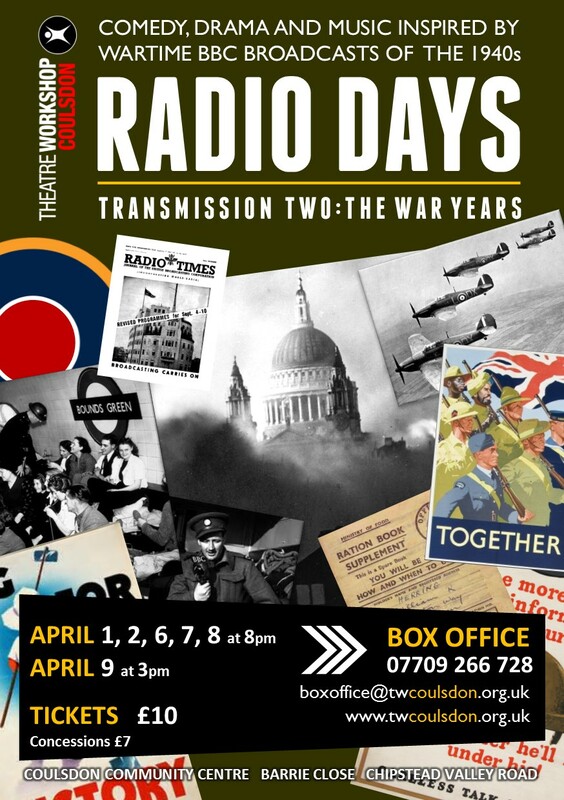 It was staged from 1st April to 9th April at Cousldon community hall, and was a welcome follow-up to ‘Radio Days: The Golden Age of Wireless’, a TWC production from 2015. Coulsdon community hall had been decorated to evoke the era, with the entrance to the tea room made into a sand-bagged entry to an air-raid shelter, wartime posters adorning the walls, the front of house team wearing clothes of the period and one even having an (unlit!) cigarette hanging from her lips! The set was designed to resemble a BBC studio of the time, with a recording booth, producers’ desk, institutional yellow and green walls, and even the iconic BBC elongated octagonal microphones.